Mike Alvarado gained revenge for his defeat to Brandon Rios in 2012 with a unanimous points victory in their rematch on Saturday night in Las Vegas. Alvarado provided a strong finish in the closing stages of the 12-rounder to get the nod 115-113 on two of the scorecards, the third judge at ringside scoring it 114-113 in his favour. The result means the 32-year-old American now holds the interim WBO light-welterweight title. It also avenges his loss to the same opponent five months ago - the only blemish so far on his 34-fight record. Rios had stopped his compatriot in the seventh last October and a similar outcome looked a possibility as the pair stood toe-to-toe in the opening stages of the bout at Mandalay Bay. However Alvarado switched his strategy during the middle rounds, instead opting to box and move as Rios chased him around the ring. His switch proved decisive as he overcame a nasty cut on his forehead to finish much the stronger - then immediately offered Rios the chance to fight again. "Brandon gave me a shot to redeem myself," Alvarado said. "I'll give him a shot for the trilogy." The previously unbeaten Rios was also keen for a third chapter, though promoter Bob Arum suggested both boxers might have to wait a little while yet to square off again. "Are these guys going to fight again?" Arum asked. "Of course they will. But it doesn't necessarily have to be next." LAS VEGAS — The long left hook by Mike Alvarado to the face of Brandon Rios with :50 seconds remaining in another brutal brawl between the two was just one of hundreds landed here Saturday night. And it was the punch that won Denver's Alvarado the interim WBO junior welterweight championship by unanimous decision. In a rematch called for by both fighters and fans alike, Alvarado won 115-113, 115-113 and 114-113. He avenged a loss in October that many called the best fight of 2012. The second matchup is now the leading contender for fight of the year for 2013. "I'm always better the second time around," Alvarado (34-1) said in the ring afterward. Rios responded by climbing the ropes and holding up three fingers. "I gave you a rematch. Now I deserve one. Let's do three." Alvarado agreed. But first, both fighters were sent to an area hospital after the fight for CT scans, on orders from the Las Vegas boxing commission. That flush left hook clinched the deciding round and put Alvarado ahead for good. Through the first half of the fight, they smiled and chatted at each other like old friends playing checkers, even after Alvarado climbed back into the bout in the third round. Two monster right hooks wobbled Rios' knees, but Rios (31-1-1) kept his balance and fought on. They both fought on. To the end. The bout was tied after the eighth round, then Alvarado hit the gas. The crowd, in a fever dream of screams, started chanting "3-0-3" -- replacing the California-heavy "Rios" chants that dominated earlier rounds. "My plan was to box and move," Alvarado said. "But he kept drawing me into a brawl." Henry Delgado, Alvarado's manager, said the fight was made at high altitude. Alvarado trained for several weeks running 7-8 miles at Red Rocks Ampitheatre. "That was the difference this time. Mike had better legs," he said. Rios, for his part, never back-pedaled. He fought forward at Alvarado all night. But Alvarado danced to Rios' right, then popped in for jabs and hooks. "They both fought their hearts out," said Robert Garcia, Rios' trainer. It is Rios' first loss in 33 professional fights. On the line Saturday in the late-night bout were career-high purses for both fighters. Alvarado was guaranteed $650,000; Rios, the bigger draw, took home $1 million. Alvarado is now first Denver-bred world champ since Stevie "Lil' But Bad" Johnston defended his second WBC lightweight title five times in 1999-2000. "As much as you know the sun is coming up in the morning, they will fight again," said Top Rank's Bob Arum, who promoted the fight. MANILA, Philippines – Mike Alvarado avenged the first loss of his career, outpointing Brandon "Bam Bam" Rios after 12 brutal rounds in their rematch Saturday at the Mandalay Bay in Las Vegas, and likely paving the way for a trilogy bout. In a Fight of the Year contender, Alvarado outboxed Rios down the stretch to gain a unanimous decision victory and earn the interim World Boxing Organization (WBO) light-welterweight belt. The judges scored the fight 115-113, 115-113 and 114-113. Brandon Rios (L) of the U.S. takes a punch from compatriot Mike Alvarado during a super lightweight bout for an interim 140lb WBO title at the Mandalay Bay Events Center in Las Vegas, Nevada March 30, 2013. 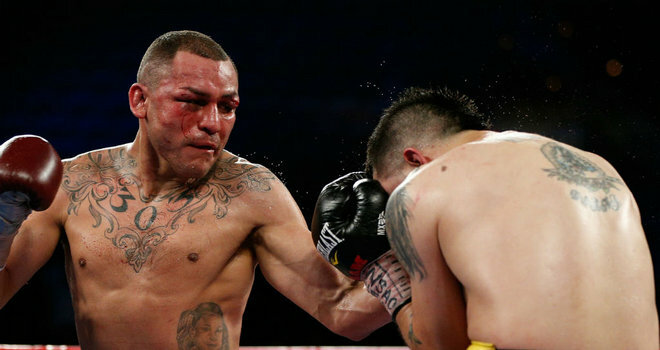 The fight was a rematch from an October 13, 2012 fight which Rios won. Photo by Steve Marcus, Reuters. It was sweet revenge for Alvarado, who was stopped by Rios in the seventh round when they met for the first time in October 2012. Alvarado was stunned by a jab from Rios in the second round, but turned the tables in the third round, where he punished Rios with several right hands. Although Rios kept moving forward and tried to turn the fight into another war on the inside, Alvarado stuck to his game plan and established space from Rios. "I moved around a lot, that was the game plan, and my mile-high training helped," Alvarado said, as quoted by RingTV. Alvarado's manager, Henry Delgado, told RingTV that their high altitude training made the difference. "We knew he would need better legs this time," Delgado told RingTV. Alvarado landed several huge right hands throughout the course of the fight, but Rios showed tremendous chin despite sustaining heavy damage. After the fight, Rios said he wants to fight Alvarado a third time, pointing out that he gave his foe an immediate rematch. "I gave you a rematch. I deserve a third fight," Rios said. RingTV reported that both fighters were sent to a nearby hospital for precautionary CT scans.